McMaster on WaPo claim Trump gave Russians highly classified info: "I was in the room, it didn't happen"
It’s important that the story, as written, does not say Trump exposed any sources. It says revealing the name of the city where the information was discovered could lead the Russians to figure out the source. There’s no way of assessing that, but it’s a matter of opinion not fact. The reaction from #NeverTrump “conservatives” was among the most disgusting I’ve ever seen — there was absolute joy to the point of giddiness that Trump was going down. There were a few voices, including me, urging caution, since almost every mainstream media anonymously sourced report on the Comey firing was wrong. Two excellent sources on that are What a breathless media got wrong about Trump, Comey and Russia this week and 8 FACTS Contradict The MSM’s Serial-Comey Lies. It took a couple of hours for the White House to respond, and the response was fairly emphatic that the story was a lie. Every single person in the room denied the WaPo story. A brief statement for the record. There is nothing that the president takes more seriously than the security of the American people. The story that came out tonight as reported is false. The president of the foreign minister reviewed a range of common threats to our two countries, including threats to civil aviation. At no time, at no time, where intelligence sources or methods discussed. The president did not disclose any military operations that were not already publicly known. Two other senior officials who were present, including the secretary of the state, remember the meeting the same way and have said so. Going on the record should outweigh the anonymous sources. I was in the room. It didn’t happen. Thanks, everybody. The spin against McMaster is that he denied things that WaPo didn’t report, an evasive move. But in fact, McMaster was specific to deny “the story … as reported.” That leaves no wiggle room. So all three American officials who were present are denying the WaPo story. More facts will come out, but at this moment there is a lesson we’ve been learning a lot when it comes to media coverage of the Trump administration: Don’t accept at face value any media report about Trump that relies on anonymous sources. Note: For greater precision, shortly after publication I added the words “information that could reveal” to the first sentence. The Bezos Post strikes again. The Masters of the Universe will stop at nothing. Constitution, voters and truth be damned. They will get what they want because that is what they want. The rest of us will be replaced by robots. Remember “normal” people are boycotting Amazon, Pepsi, Target and Macy’s etc. The media has been repeatedly burned by anonymous sources since Trump took office. You’d think they’d be a bit more careful rushing out the latest scoop but I guess page views are far more important than actual accuracy. Entire story may have been a deliberate attempt to overshadow the breaking Seth Rich Story. But in fact, McMaster was specific to deny “the story … as reported.” That leaves no wiggle room. Assuming you read what you retweeted, how can anyone assume you’re being anything but intentionally dishonest here? LOL, Awing the dishonest questioning someone’s honesty. Does that pay extra? Why is it that you can’t actually argue against my points? Why is there zero substance, zero actual argument that I’m wrong, in any of the comments (except the one that claimed McMasters and Tillerson said things they quite clearly did not say)? Because you are a paid prog, dimmer than a blown light bulb, whose only value is to be mocked and laughed at. You’re the squeaky toy the cat plays with. That’s the excuse you tell yourself for why you can’t come up with actual, substantive responses to my arguments? My comment was primarily for Professor Jacobson, who knows exactly who I am, and has since shortly after I first found this blog in 2011 when looking up the professors that taught courses related to financial regulation at the law school I’d just been accepted to. I’ve no doubt the professor knows your a left wing commie kook. Because your garbage isn’t worthy of a reply. Barry replies to my comments because they’re not worthy of reply? Who cares if it’s accurate–ratings are through the roof! Talk about the tail wagging the dog…. In a battle of honesty between Professor Jacobsen and The Washington Post, there is no contest. I wouldn’t know how to begin to compare the honesty of Professor Jacobson and a nonhuman entity, and I really don’t understand why it’s relevant to whether or not my professor is being dishonest here. “anonymous source”? Has it been collaborated from another independent source? Only THREE people were present! You would think that with “fake news” becoming the initial reaction of a reading public that trusts journalists no more than they trust politicians, reporters would make every deffort to present solid evidence to the public. But yet another “anonymous”? Really? That works for you? This belongs in the trash upon receipt. It’s garbage. More fake news. If ALL three people who were present have testified that the report is a lie, that all of the information that was shared was already public information, where is the Amazon… I mean the Bezos Post, getting their information? Assuming you mean all three US officials that weren’t Trump that were present, I don’t really understand why you’d ask about some fantasy. Neither McMasters nor Tillerson have stated that all of information that was shared was already public information, nor did either deny that the substance of the report from WaPo (which Reuters has independently confirmed) was false. Do you not have basic reading comprehension skills? Did you miss the part about public trust? “Anonymous sources” from proven liars like REUTERS (geez) and the hopelessly compromized Bezos Post? It isn’t my reading comprehension skills here that questionable but your basic common sense. Did you just arrive on our planet recently? Do you not understand the problem we are having “journalism” and wall-to-wall institutional corruption? We need PROOF!!! What more confirmation do you seriously need than McMasters not denying the substance of the articles, and instead only specifically denying claims that the articles didn’t actually make? It’s very depressing how right Trump was about the fact that he could stand in the middle of Fifth Avenue and shoot somebody and his deranged supporters wouldn’t leave him. Awning: The burden is on those making this claim to come forward with specific evidence (not unnamed sources, rumour, and innuendo–EVIDENCE) to establish its truth. That has plainly not happened. The burden is not on those who question the veracity of this claim to deny it in exactly precisely the specific way that will satisfy you (which, even if they did, you would quickly tack to claim there is something else they didn’t, in your mind, adequately deny). And it “ain’t” gonna work this time! It hasn’t worked once since Trump announced in summer of 2015….so it won’t work period! I didn’t much like it when Obama had that power, but a President can de-classify any damn thing he wants. Hillary allowed classified info to get out there for all the world to see and actually exposed several of our assets. Of course, we know without any doubt it didn’t happen here. Why? Because it’s being reported by a fake news organization(s). Everything is fake. Yes, it’s true, the president by definition cannot leak. This is one of those cases where it’s literally true that if the president does it it’s not illegal. But it’s also irrelevant. As far as I can tell nobody is accusing Trump of a crime; what they’re accusing him of is endangering our intelligence sources through incompetence, which is not a crime, but is an impeachable offense. If the story is true, which I very much doubt, then Trump has provided the grounds for impeachment, should a majority of the house and 2/3 of the senate decide to get rid of him. If they don’t then it doesn’t matter what he does. Democrat presidents are impeachment-proof because Democrat senators have shown that they will never vote to convict a Democrat president no matter what he did. Republican presidents are not impeachment-proof because given sufficient evidence of a serious offense Republican senators will vote to convict. In this case, though, even if the story were true I doubt the Republicans would impeach him for it. which is not a crime, but is an impeachable offense. Cool—your copy of the Constitution must have some supplemental text which is missing from mine … and everybody else’s. Mine is depressing pedestrian; “crimes” are a definite requirement, with little leeway for fanciful enhancement. You might as well speak plainly – anything is an impeachable offense, should the house choose to do so. The R party is as corrupt as the d party, but no, no impeachment is going to occur. The whole of DC is corrupt, way beyond most peoples comprehension. The “media” is part of the DC construct, long ago co-opted. This will be a continuing battle, might as well get used to it. Just more ‘deep state/MSM’ BS. Don’t believe a word from WaPo. This is war. 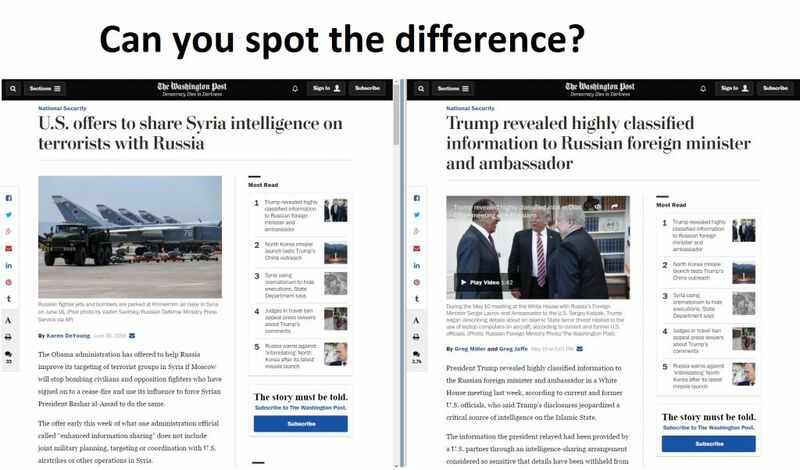 WaPo is an enemy combatant. BS is the only weapon in its arsenal. The mainstream press has become utterly unglued. The #NeverTrump crowd cares only about destroying Trump. What’s best for conservativism never enters into it. They are driven only by their hatred for him. I’m not talking about alt-right weirdos – they don’t count. I mean literally, unless they remove their off-brand Nike knock-offs. I mean normal people. Who voted for Trump and now says something remotely like this? He wasn’t talking about alt-right weirdos since they answer Yes. If you really care about conservativism, and you have a friend with TDS, do you really have a friend? “I guess everyone can put the #fakenews hashtag away for a while, eh? Yesterday, the White House had nat-sec advisor H.R. McMaster issue a broad but unspecific denial after the Washington Post reported that Donald Trump had blurted out highly classified intel to the visiting Russian delegation last week. Rex Tillerson followed suit and the White House communications team issued a terse denial before heading behind closed doors for a meeting. You should read the whole thing, of course. It includes T-rump’s tweets. Some here can’t read it, because LA-LA-LA…I can’t hear this…!!!! Except that nothing in Trump’s tweets reveals what you claim it does. It is more than possible to discuss an abstract that reveals nothing classified. Done it dozens of times myself. It is your dishonest #NeverTrump opinion, echoing Hot Air’s dishonest #NeverTrump opinion, that he revealed something he shouldn’t. Some here will believe anything, because TDS…I only hear this…!!!! Rags, the progs best friend. I do read Hot Air, and other sites. Complaints about Trump are frequently process complaints, like this one. He doesn’t manage “news” cycles the way real politicians do, and Washington is bewildered and outraged by that. The question is whether he shared information detrimental to US interests, which is what the Post said, or implied, that he did. And the further question is who is telling these stories to the Post, and whether that person is credible. And the other question is whether outrage over this narrative is based in fact or purely in visceral personal opposition to the current occupant of the Oval Office. In the case of the Washington Post, NY Times, etc., I think so, and tend to disbelieve what they say because I think their bias is obscuring their vision and twisting their reporting into mere opinion. That was true before Trump, and will remain true after. HotAir ans WaPo have become rags goto news sources on Trump. …which was yesterday, prior to Der Donald’s contradictory tweets. I also note that Prof. Bill failed to name anyone, which I would have found very helpful in assessing his comment. I doubt very much he meant any conservative who had anything less than apologia for T-rump. Which is all you ever publish. Which is precisely why it was so disgusting. Have you thought that he didn’t name you because he thought it was obvious? Can 30 thumbs down be wrong? Was he one of them? Do you know that you are likely the only person on LI who didn’t think about what the effect of his vote would be on conservativism? And I am sure that you are the only one who didn’t know when he pulled the lever on Nov 8 whether Trump or Clinton was the better choice for conservativism. It should be even easier to answer now when you have more facts – and yet you won’t answer. This tells us where conservativism sits in your life. Because, like you, they wanted it to be true. I made no comment yesterday, liar. Prof. Bill could not have been “disgusted” by anything I wrote, VAPigman. Yes, they can and often are, because of the turd-swirl of T-rump suckers here who work hard at ThoughtPolicing as pure Stalinist goons. You are among them. It’s funny you think that actually has any effect on me. You should ask Prof. Bill if he downthumbed me. His email is easy to find, VAPigman. No. I of course “know” such stupid, lying thing. I assessed the effect of my vote very carefully. I reassessed it constantly. I determined that I would not vote for either stinking, lying, pathological Collectivist fraud. You did. Your choice. All you thought about was YOU. Which is unimpeachable. It was your vote. Mine was mine. You stinking, lying, pathological Collectivist fraud. “Because, like you, they wanted it to be true. Again, you simply impute to me lies of your own making. I neither wanted or didn’t want any truth to be true. That would be as stupid as most of what you do. I’ve often counseled patience here, and for letting matters develop before jumping stupid one way or the other. See Zimmerman, George, etc. Lastly, I don’t know who “they” are, and nobody identified “them”. But, as is obvious, I was NOT one. You stinking, lying, pathological, Collectivist fraud. But you can see that Lewandoski “assault” on Michelle Fields clear as day. Which is another prog lie parroted by you. And you repeat your ad hominem lies as big as day. It really is all you have. You are a TWOT. No lie as you well know. Care to lie some more, proggy? RE: “The reaction from #NeverTrump “conservatives” was among the most disgusting I’ve ever seen — there was absolute joy to the point of giddiness that Trump was going down. That’s because the never were “conservatives” in their entire, long lives. Bezos’ WaPO is putting the “knee jerk” back into liberalism, or at least, its flying monkeys in the msm…. Is the story accurate? Who knows. IN the first place, we have no idea who0 the “source” is and, therefor, no way to verify its veracity or accuracy. Second, we have no specifics on the information allegedly disseminated. Without that information, we have no way to determine how sensitive the information was. What we are left with, is zip; nothing but inference and speculation disguised as fact. Now, if the story id accurate, who really cares? Unless the President released some information which could really harm the US, such as our launch codes, the locations of our Trident submarines or the date of our invasion of NK or Russia, what harm was done? This is nothing more than the same old BS fake news that we have been subjected to for the last year. Remember this about Watergate. Woodward and Bernstein were desperately attempting to find evidence that :President Nixon ordered, or at least knew, of the plans to burglarize the DNC. They never found any. All that they found was that Nixon knew about it AFTER the fact and likely agreed with the plan to cover-up of the involvement of some of his aides. The same game plan is in play here. The media is desperately attempting to suggest that the President is an ally of the Russian government, or at least a dupe. So far they have struck out on producing ANY evidence of this. Hmmm.. What about the Pakistani doctor that helped us find Bin Laden? Soooo, how did that work out for the good doctor? Trump is Prez no matter how much the left regrets it. He can declassify every damn thing he wants. You don’t like it? Don’t vote for him in 2020. In the meantime, full steam ahead. I want Trump to tear down every presumption and edifice of the left. TEAR THEM DOWN. Ignore them. Let them scream bloody murder until they faint from oxygen deprivation. The US Secretary of Defense, who was then CIA Chief Leon Panetta, has confirmed the role of Dr Afridi in ascertaining the whereabouts of Bin Laden inside the compound in Abbottabad. US Secretary of State Hillary Clinton has said that Pakistan has no justification for holding Dr Afridi. The U.S. Representative for the 48th District of California, Dana Rohrabacher asked President Barack Obama to intercede on Afridi’s behalf, introduced two bills, H.R. 4069 to award a Congressional Gold Medal to Dr. Shakeel Afridi and H.R. 3901 to declare Afridi a naturalised US citizen. The US Senate panel cut $33 million in aid to Pakistan over the conviction of Afridi: $1 million for each of the 33 years of Afridi’s sentence. The only good that has come from this fake news is that like crying wolf over and over the press is destroying their credibility. When hillary was blabbing above Top Secret stuff all over the internet, the msm didn’t seem to think that was a very big deal. But for Trump to warn Russia that their airliners full of HUMAN BEINGS could be the victims of laptop bombs that we had discovered through intelligence, why that approaches treason! The only answer is impeachment! Can’t these fools see how stupid they are becoming? Washington Post’s conjecture, not facts, and a menagerie of anonymous sources. Trump is on defense right now – soon to go on offense. WE are Trump. WE are not going down: the GOPe is. The MSM and such as McCain and Lindsey Grahmnesty are now into total fabrication. This is the fourth story the WP has headlined in a week that has turned out to be absolutely false. I consider anything published in the WaPooPoo as fake news, including yesterday’s sports scores. The Washington Post story appears to be dubious at best. What I want to know is, WHO are the sources? If only Trump, high-level American officials, and Russians were in the room, then to whom is the Post talking? If the Post is using anonymous leaks from Russians to attempt to undermine the US president, that’s a pretty serious matter. Probably neither criminal nor treasonous, strictly speaking, but wholly despicable. Did T-rump tweet what he tweeted, you irrational liar? Did T-rump lie about why he canned Comey, you irrational T-rump sucking cultist? Irrational is precisely what you are. No one disputes the president tweets. You are on the side of McCain, Graham, the Washington Post, the New York Times, in effect any side that is for the destruction of America. You champion every lie they tell. You’re the progs best friend, parroting their fake news as fast as you can. He didn’t tweet what you claim he did, chew toy. Every damn story printed in the WP is fake. Every one. Why any sane person would give any consideration to them is beyond me. Just one false story should be a signal. A continuing narrative of fake news should be a clincher. The Washington Post is a fake news site, dedicated to the destruction of America. Along with all the other fake news sites. There are few evasions more transparent than denying what no one accused you of doing. Some enterprising soul took the time to compare the way the Washington Post wrote up a similar meeting between BO and the Russians. It is instructive. Meanwhile, the kiddies over at Reddit are gleefully pointing out that the Washington Post pulled up this junk story within an hour of the latest breaking story about Seth Rich, who is rumored to be a Wikileaks contact. They are also taking great comfort in knowing that this Washington Post story was debunked within hours. I checked that last point: It took 1.5 hours from the time of the Washington Post publication to publication via The Gateway Pundit of the video by McMaster. From where I sit, it looks like somebody in the Trump administration had a bolt of lightning all limbered up and waiting for this bit of Fake News. What’s more instructive is to see who gleefully parrots the fake news. Valerie, have you seen this? Yeah, I saw it. That’s not my favorite website, but they have made some very interesting observations. If these patterns hold up, Podesta’s Washington Post is going to be hammered as hard as his last campaign, and they will deserve it. If the US and Russia are sharing limited intelligence with each other on potential threats, then it sounds like what Trump did was indirectly save American lives. Seems like a reasonable and, notwithstanding the media hysterics, more or less routine use of intelligence.